Lately, we’ve been seeing a trend wherein companies get their selling franchises and port it off through various spin-offs in different consoles – either because it’s positively received enough to invest on the expansion of the series or it’s popular enough to further milk the fandom. Point is, we’re seeing a lot of popular games ported into easier produced bite-sized pieces for the latter reason. They tend to be carbon copies of other popular mobile games with minor unique features, have less content, and a huge inclination to be paid for just to be able to have the full experience, for the sake of being able to nab a couple more bucks from the series cannon. But not all games following this trend deserve such a cringe-worthy impression, as some are actually still good on their own right, despite being pay-to-win feed. 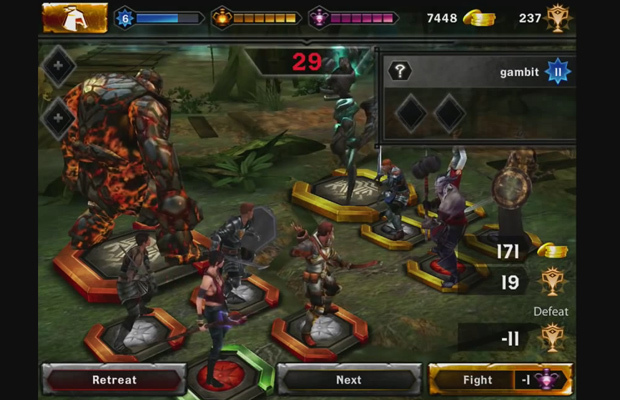 In this case, we talk about EA’s Dragon Age mobile counterpart: Heroes of Dragon Age. Last time Electronic Arts did this was with Dungeon Keeper, and that was a horrible port into the free-to-play app world as it heavily abused its freemium status. 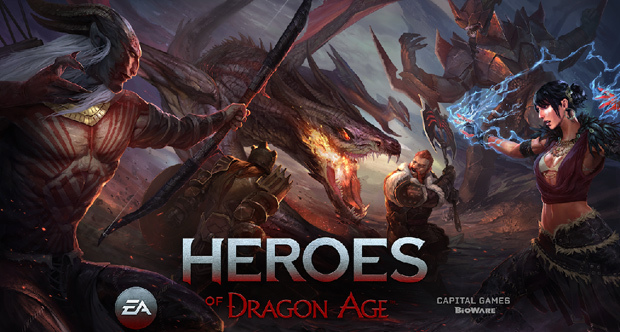 As a Dragon Age fan, I’d be worried EA wouldn’t get it right again (as they have a history of not really fixing broken things in their games in succeeding iterations), but I’m relieved to see Heroes of Dragon Age as a decent mobile port. Though it may be too presumptuous to say it gets freemium right, it does better comparatively to its predecessor. In fact, it shows that EA actually understands how a game can utilize in-game purchases without aggressively harassing the player. It’s nothing major, but it’s something. Heroes of Dragon Age retells the story of the continent of Thedas through a card-collecting based game fought in a strategic table-top setting. 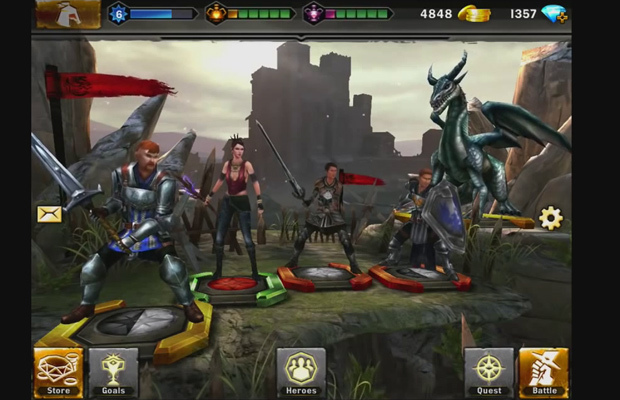 Instead of cards though, you get fully animated 3D models of characters based on the Dragon Age series. You assemble a team of five. Like most unit collecting games, characters come in varying rarities – from common generic soldiers and bandits (and even deer) to epic legendary heroes and monsters directly from the main series lore. Each character comes with their own set of health, and attacking power – the legendary ones having more advantageous and unique traits and skills to consider. 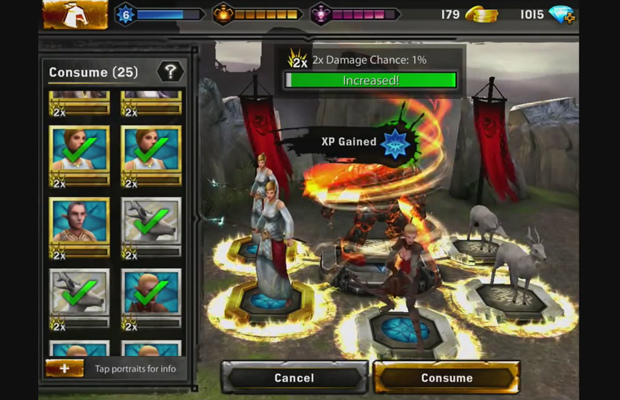 Units with high initiative move faster in battle and will often get the chance to strike first. Characters with lower initiative move slower, but deal higher damage. Stats are also variable to where you position them in the team formation. Every character has an allegiance or a faction, designated by the color of the tile their models are standing on. When you match these tiles in a row or column, bonuses unlock such as higher crit chance, or more defense and health. The fifth slot is usually reserved for giant units like dragons, golems and the tree creatures called Sylvan. 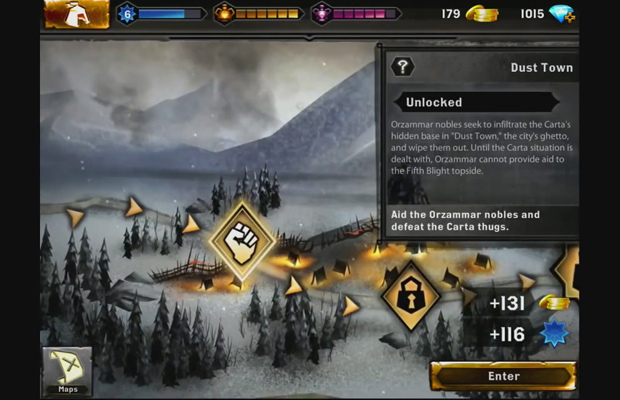 You level your characters by gaining experience points through battle, but since this is also a “card collecting” game, you have the option of leveling them up by fusing identical units together. 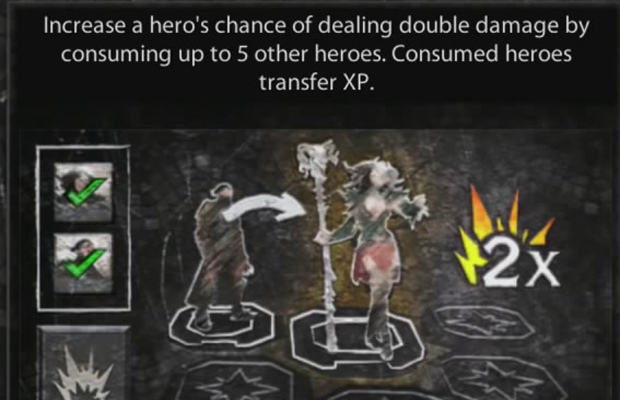 Fusing combines their experience pools so no points are lost, while also raising their level cap in the process. 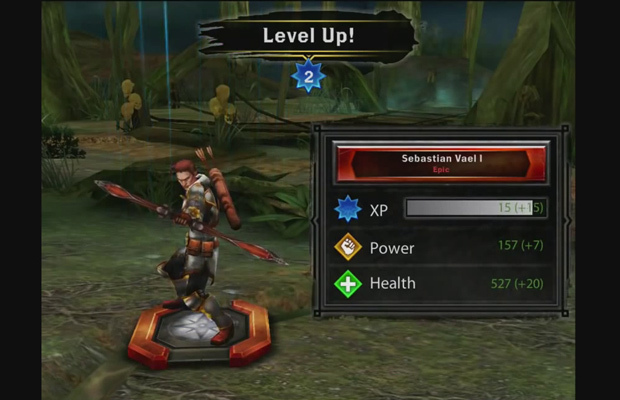 You can combine up to five units to another unit to level the more desirable one up. This allows you to get rid of less desirable monsters from clogging up your character inventory by cashing in on their redundancy and improving someone you actually want to keep. That’s where all pretense of control and strategy end. Though you have plenty of systems present to let you put your personal touch on squad creation and upgrading, the rest of the game revolves around traveling from map to map fighting repetitive battles to collect character packs. 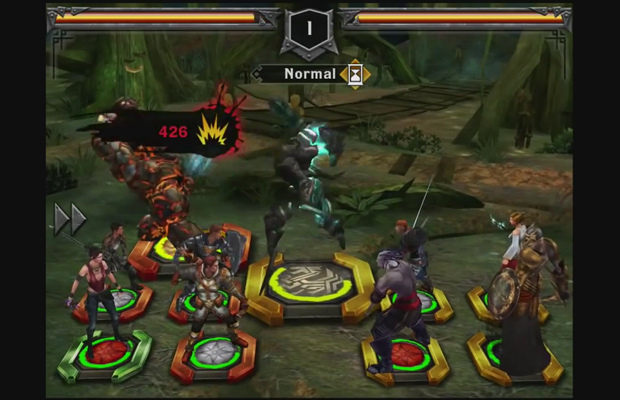 In battle, your squad lines up to the left and your enemies to the right. They then proceed to attack each other randomly, turns decided by comparing initiatives, until one side is completely decimated. No control, no strategy. In other words, you’re just throwing your team out into the fight hoping you’ve given them enough power to pull a victory. The game isn’t all that predictable though as your team can fail against another with marginally inferior stats, or win against teams over five levels above yours. It’s really all up in the air. I guess this gives a thrill in the game wherein fights are still random and not completely based on having the biggest numbers, but it sometimes leaves a bad taste in your mouth when a team you worked and grinded on for hours will get beat by another team that features a deer. But more often than not, you can tell if you can a win a fight or not from the opening moments of battle. If you don’t want to watch the animations play out and just want to grind out rewards, a fast forward button allows you to skip to the result screen. So even if there is a considerable chance for an underdog victory, big numbers still count, thus making the game more of grinding for easy XP to ensure advantage than a game of actual depth and strategy. Like I said earlier, this game does freemium right. There is a stamina system for both single player and PVP battles, but these are restricted by separate energy reserves, meaning you can bounce between the two options for quite a while before you run out of both. Should you be hooked and need to keep playing past this point, the option to buy more stamina is present. But despite this standard mobile game irritation, I never felt compelled to give into the purchase when energy recovers as quickly as it does. The game also doesn’t continually pester you to make purchases as you can proceed just fine without them. Character packs often are generous as I’ve been able to get two legendaries in a pack of ten (though it’s still not totally worth the price). Once again the temptation of buying power-ups or new character packs may be present when you run into a stage beyond your ability to overcome, but the frustration never broke the tipping point to make me want to cash in on these options. The main drive that ends up motivating players here is the looks of your squad. At nearly half a gig worth of memory, the game promises (and delivers) an impressive display of fully rendered and detailed 3D models (that are even rotatable) with unique battle animations. Heroes of Dragon Age did well making use of the expansive and diverse races found in the existing lore. The effects and environment you will travel through is no less impressive and a great sign of things to come in this week’s launch of Dragon Age: Inquisition. Just be aware that the older your mobile device, the longer these powerful visuals will take to load! All in all, the game isn’t so bad. True it suffers from a lot of freemium sicknesses but it isn’t the worst example out there. In fact it’s even quite generous in most areas. The only things that makes this game a drag are the repetitive combat phases and the lack of depth and strategy it requires to play the game. 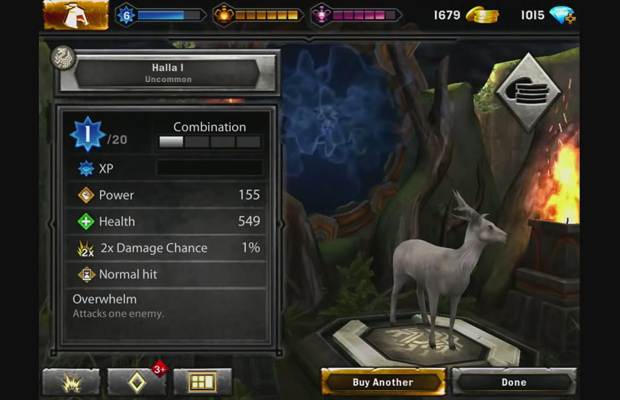 Even though I’m indifferent to Heroes of Dragon Age, it’s a stark improvement over EA’s past romps in the mobile field. Let’s just hope that it can only get better from here. A brutal 5v5 PvP map goes live for ROSE Online players, offering a new twist to battle.